UB-TR-JB03-F-IN designed to be mounted to Uniview CCTV cameras and is used as a cable termination enclosure. Helps simplify installation. UB-TR-JB03-D-IN designed to be mounted to Uniview CCTV cameras and is used as a cable termination enclosure. Helps simplify installation. UB-TR-JB07-WM03-D-IN designed to mount cameras to a wall and also used as a cable termination enclosure. Helps Simplify Installation. UB-TR-JB03-E-IN designed to be mounted to Uniview CCTV cameras and is used as a cable termination enclosure. Helps simplify installation. UB-TR-UP06-IN Uniview Pole Mount Adapter. Neat & Integrated design. Requires Wall, Ceiling or Junction box to complete installation. UB-TR-JB07-B-IN Uniview Cable Base designed to be mounted to CCTV cameras and is a cable termination enclosure. Helps simplify installation. UB-TR-JB07-WM04-A-IN designed to mount Uniview cctv cameras to a wall and also used as a cable termination enclosure. Helps Simplify Installation. UB-TR-JB04-IN designed to be mounted to Uniview CCTV cameras and is used as a cable termination enclosure. Helps simplify installation. UB-TR-WE45-A-IN Uniview Wall mount for PTZ cameras. Neat & Integrated design. Helps simplify installation. UB-TR-UP08-B-IN Uniview Pole Mount Adapter. Neat & Integrated design. Requires Wall, Ceiling or Junction box to complete installation. UB-TR-UC08-B-IN Corner Mount. Neat & Integrated design to mount cameras on corner, requires Plate Adapter or/and wall mount to complete installation. UC-IPC3612LR3-PF28-D Uniview (EASY) 2MP IP Ultra H.265 2.8mm Fixed 30m IR Dome Camera. It has Day/night functionality 3D DNR (Digital Noise Reduction). UC-IPC3614LR3-PF28-D Uniview (EASY) 4MP IP Ultra H.265 2.8mm Fixed 30m IR Dome Camera. It has Day/night functionality Smart IR, up to 30 m (98 ft) IR distance. UP-IPC6322SR-X22P-C Uniview (Easy) 2MP IP Ultra H.265 22x Optical 150m IR PTZ Camera with Smart IR and Triple streams. UC-IPC2325EBR5-DUPZ 5MP WDR Starlight (Motorized) VF Network IR Bullet Camera. It includes Day/night functionality and Up to 120 dB Optical WDR. 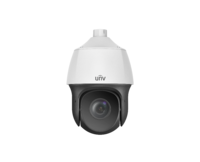 The UC-IPC3235ER3-DUVZ Uniview (Prime) 5MP IP Ultra H.265 2.7~13.5mm Motorised 30m Starlight IR IK10 Dome Camera with Starlight illumination.